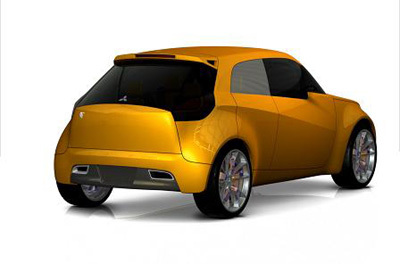 Designed at the Mitsubishi Motors Design Center in Cypress, California, and debuted at the 2006 Detroit Auto Show, the Mitsubishi Concept-CT was a compact 4-door hatchback powered by 4 in-wheel electric motors and a 3 cylinder petrol engine. The Concept CT was designed to be practical as well as fun, while returning an advantageous mpg. The 4 in-wheel electric motors are powered by batteries located under the rear floor and in the front. The fuel tank for the 1.0 litre, 3 cylinder engine - which drives the rear wheels and acts as a generator for the batteries - is positioned at the front also. Total power for the Concept-CT is 134 horsepower (100 kw). Inside the Mitsubishi Concept-CT, design of the main controls is influenced by motorcycle forks, and clean simple lines are everywhere. 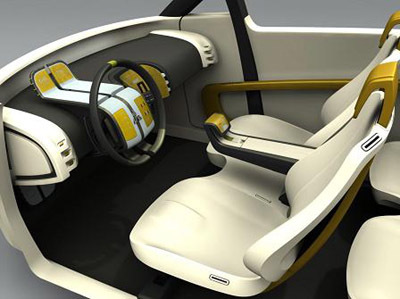 The center console, floating between the front seats, houses a fingerprint reading security system, as well as a computer touch pad interface. The thin, floating front seats and rear contoured bench seats comfortably accommodate 4 passengers. And the thin cushions and seatbacks increase available interior space. 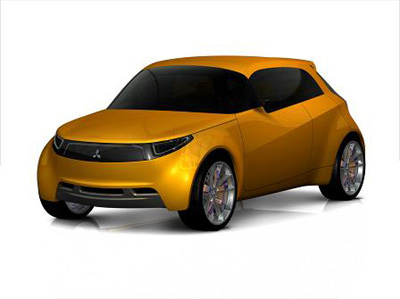 The Mitsubishi Concept-CT provides a glimpse into the future of hybrid Mitsubishi vehicles incorporating in-wheel electric motors, a production goal Mitsubishi hopes to achieve by 2010.